Samsung has released a new app which is designed to give users more control over the audio on their Galaxy devices. It's called SoundAssistant and it is compatible with the Galaxy S8 and Galaxy S7 lines as well as other handsets running the latest version of Android. There are three main features in SoundAssistant that are worth your attention. First is the option to change the behavior of the volume keys which, by default, will raise or decrease the volume for the ringtone. The app lets you change that to adjusting the volume for the media instead which, personally, I find more useful. Here's an example: before playing a game or video, you can quickly lower (or mute) the volume for media without bothering anyone around you. 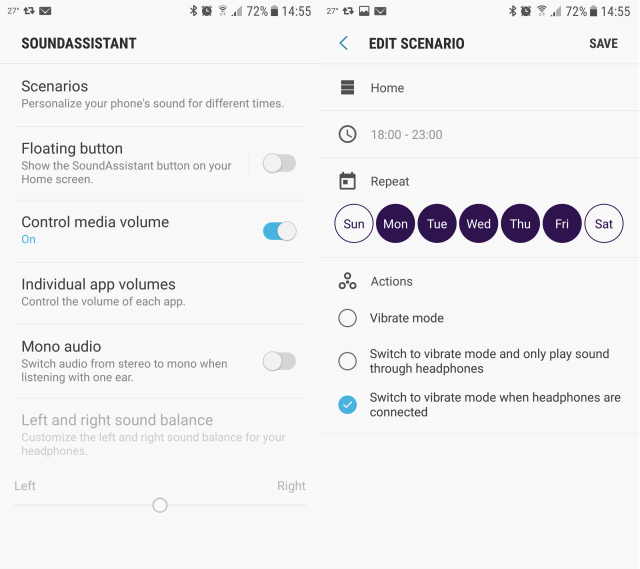 The second noteworthy feature is called Scenarios, and it gives you the ability to set up schedules for when to activate vibrate mode. There are three options: vibrate mode, vibrate mode and sound playback through headphones, and trigger vibrate mode when connecting headphones. This is more useful than do not disturb, as it lets you set up more than one schedule and choose how that vibrate mode is enabled. Last but not least is the option to set up the volume on a per-app basis, so you can, for instance, have a game on mute and another app at a different volume. This comes in handy if you don't want others around you to know that you're goofing off, for instance. But that is not all that SoundAssistant can do. The app also lets you have a floating button for it on the homescreen, enable mono audio when you are using only one headphone or earbud, and change the sound balance to the left or right. SoundAssistant is only compatible with Galaxy devices running Android 7 Nougat, and is available to download from Google Play.